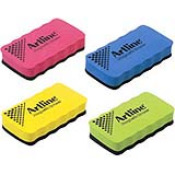 ERT-MM Magnetic Erasers are designed to work with all your whiteboard marker needs. Special magnetic erasers allow it to adhear to magnetic whiteboards. Available in Pink, Blue, Yellow, Green. Sold Individually 1-each. Ergo Style for Easy Handling.